After a major power outage, just grinding coffee in the morning feels fantastic. The freak snowstorm left us without power for a little under three days, about the same amount as after Hurricane Irene but the loads of heavy snow caused quite a bit of damage on our trees. On my way to the orchard to buy pears yesterday I had to make a detour, as some roads are still closed. When the power is back, and the mess of candles, dirty dishes, laundry, candle wax, water buckets and other remnants of living without electricity is cleaned up, I usually tackle the fridge and the freezer, throwing out soggy frozen herbs (wondering each time why I even bother freezing them, those are the first to spoil), and cooking with whatever can be saved. It always takes me a few days to switch from the rescue cooking mode to the fun cooking mode. Today was the day. The gorgeous fall weather simply called for a pear pie. It is hard to believe that a week ago I walked around in snow boots knocking off a foot of snow from trees and shrubs. For the pear pie filling I used pre-cooked custard, which is common in German recipes. It makes the pie wonderfully moist without being too sweet. I used Dr. Oetker Cream Pudding, which is available in the United States. The brand’s Vanilla Pudding can be used instead, which is even more widely available. 1. For the crust, put the shortening, flour and salt in a food processor. Pulse to a crumbly consistency. Add just enough ice water, one tablespoon at a time, to the dough so that it forms a ball. 2. Roll out the dough between to sheets of wax paper to fit a 9-inch greased springform pan plus a 1-inch edge all around. Remove the upper layer of the wax paper and flip the crust over into the pan. Even out the edge and place in the freezer. 3. For the filling, mix the custard powder with a few tablespoons of the cold milk and the sugar. Stir until smooth. 4. Bring the rest of the milk to a boil. Remove from the heat and whisk in the custard mix. Put it back on the burner and cook for about 1 minute, stirring vigorously, until the custard thickens. Remove from the heat and let cool, whisking every so often. 5. For poaching the pears, bring 2 cups of water, the wine, ½ cup sugar and lemon zest to a boil in a wide pot or a deep skillet. Stir to dissolve all the sugar. 6. Peel the pears and cut them in half. Remove the cores and place the pears in the poaching liquid. Reduce the heat and simmer for about 15 minutes, until the pears are easily pierced with a knife. Turn them once or twice during poaching. 7. Drain the pears (you can refrigerate and re-use the poaching liquid). Place the pears cut side down on a cutting board and cut them into even slices but do not cut them all the way through so that you can place them on the pie like a fan. 9. Whisk the cooled custard. If it is lumpy, you can smoothen it by blending it with a stick blender for a few seconds. Pour the custard into the pan with the crust. 10. 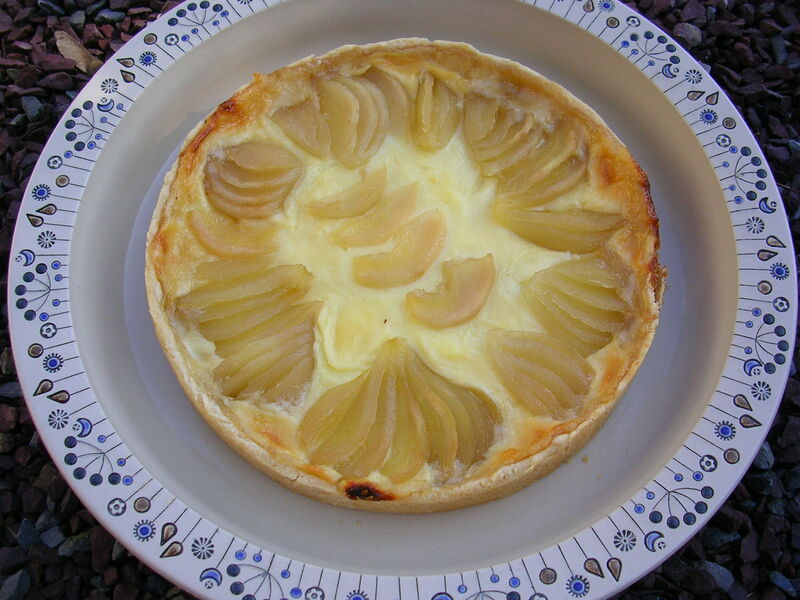 Place the cut pears on the custard in a circle, tips to the center. Fan them out as much as possible. 11. Mix the amaretto with ¼ cup sugar and drizzle over the pears. 12. Bake in the preheated oven for 35 minutes, then increase the heat to 375 degrees F and bake for another 30 to 35 minutes, until the crust and the top are golden. Let cool for 5 minutes, then pass a knife around the edge and carefully remove the rim. Let cool completely on a wire rack. Refrigerate until serving but take out of the fridge 30 minutes before serving. I adore pears in any form, wether in a cake or a salad with walnuts and bits of gorgonzola cheese… Was always unhappy that the two big pear trees in my father’s garden never had many of those delicious pears.